There are several methods for using your felling foot. 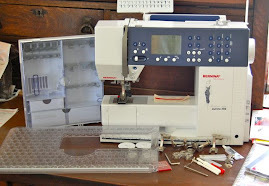 I will explain the method I find the easiest, whether using an original vintage foot or whether you have a newer one in your attachment box. 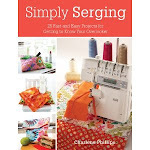 Later I will show you the "original" method given in all the older sewing books. 1. Pin your two pieces of fabric together, one on top the other, so the lower piece extends about ¼ inch from the top fabric. In the photo, the lower piece if my red fabric. 2. Fold this edge over the upper piece, slide it under the felling foot and sew a couple of stitches. 3. 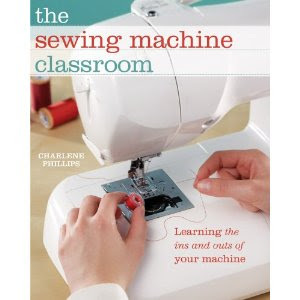 Leaving the needle in the work, raise the foot, guide the fabric into the toes of the foot and continue sewing. Guide your fabric as it enters the felling foot. In the photo, I am taking those couple of stitches. 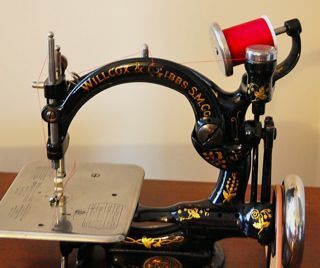 Remember to then, lift that presser foot, and wiggle the fabric into the toe (just like the photo below you will see the fabric over the little bar in the front). When you are finished with this step, you will then have a single fold, encasing the shorter fabric. 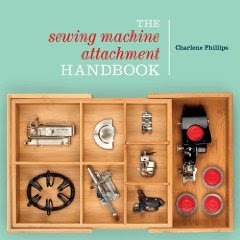 Your stitching will have sewn onto a raw edge. 4. Fingerpress the seam open. With your fabric facing you, fold the seam over to the left. Lower the felling foot and take a couple of stitches. The newer felling foot has a slit where the needle enters, instead of a single hole of the older ones. 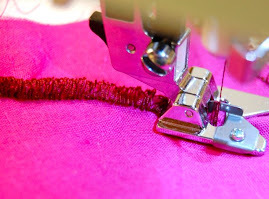 This slit will allow you to insert lace or any ribbon, rick-rack, or embellishment as you sew the second line of stitches. This is such an easy process. 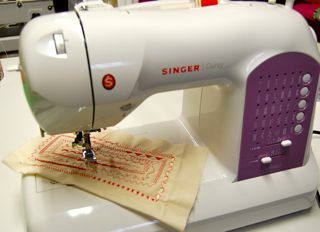 The beauty of the felling foot is keeping your seams straight and your stitching has a consistent seam allowance. Lovely on either side! Your raw edges are very securly sewn within the fabric and no unraveling at all.